Preheat oven to 350°. Spread walnuts on a parchment or silicone-lined rimmed baking sheet. Bake for 10 minutes, or until walnuts are toasted and fragrant, stirring every 5 minutes. Check walnuts every few minutes to prevent burning. Cool to room temperature and chop. Store in a covered container until ready to use. Fill a large bowl with ice water. In a small bowl, combine 2 Tbsp milk with cornstarch, whisk and set aside. Combine remaining milk with heavy cream, sugar and honey in a medium saucepan and place over medium heat. Bring milk mixture to a low boil. Cook until the sugar and honey dissolve, 3 minutes. Remove milk mixture from heat and gradually whisk in the cornstarch mixture. Return to a boil and cook over moderately high heat until the mixture is slightly thickened, about 1 minute. Pour into a medium bowl. Whisk in salt and rosemary. Set bowl in the ice water bath to cool, 20 minutes, whisking occasionally. Cover and refrigerate until well chilled, at least 4 hours or overnight. 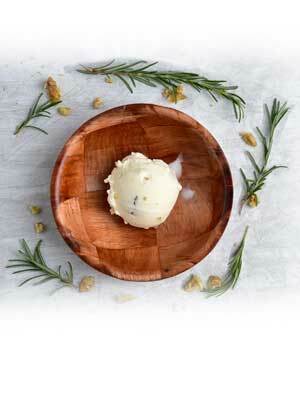 Once chilled, pour ice cream base through a fine mesh sieve to remove rosemary pieces. 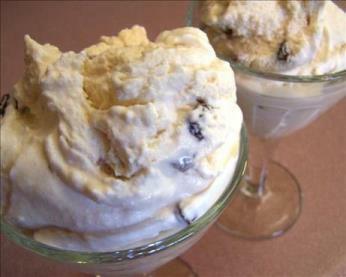 Pour into an ice cream maker and churn according to the manufacturer's instructions. When churning is complete, gently fold in walnut pieces. Transfer to a freezer-safe container and freeze until firm, at least 4 hours. 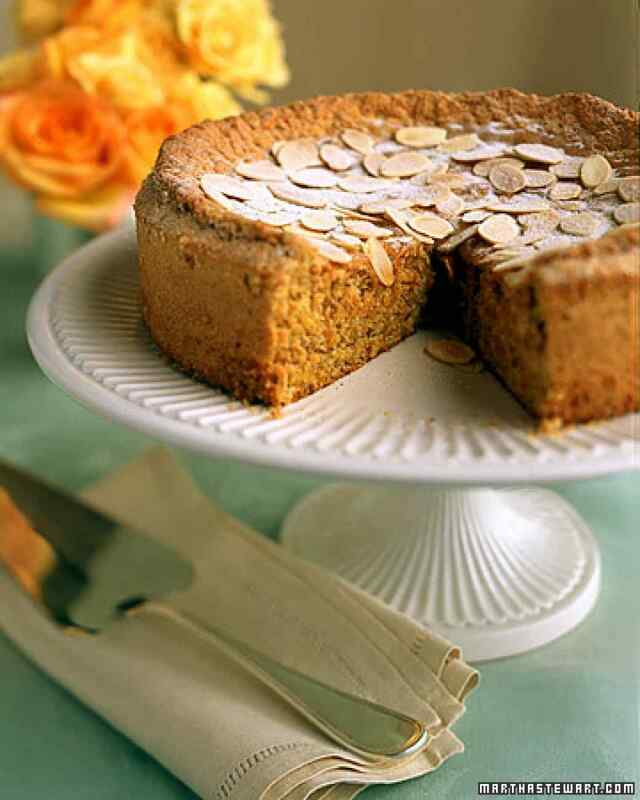 A luscious, moist torte topped with warmed apricot glaze; sliced almonds and powdered sugar. Delicious! Preheat oven to 325°. 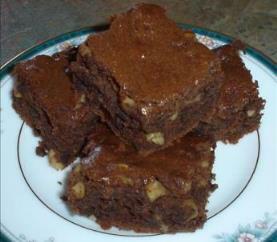 Place nuts in a single layer on a rimmed baking sheet. Toast until golden and aromatic, 8 to 10 minutes. Shake the pans halfway through toasting to make sure nuts brown evenly. Set aside to cool. Grease a 10-inch spring-form pan with margarine, sprinkle with sugar, and tap out excess; set aside. Place 1/4 cup sugar, 8 oz almonds and the apricots in the bowl of a food processor; process until finely chopped, 1 to 2 minutes. Transfer to medium bowl, add lemon zest, cinnamon, nutmeg, and cloves, and stir to combine; set aside. Using an electric mixer fitted with the whisk attachment, whisk egg yolks and 1/2 cup sugar on high speed until light and fluffy, 3 to 4 minutes. Transfer batter to large bowl; set aside. Clean and dry the mixer bowl and whisk; use to beat the egg whites with salt and lemon juice until frothy. Slowly add 1/4 cup sugar, and continue whisking on medium until peaks are stiff but not dry. Fold beaten whites into beaten egg yolks. 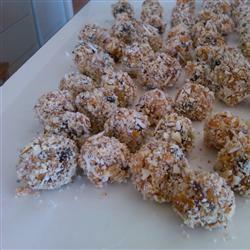 Add the apricot-and-almond mixture, and fold in until just combined. Pour batter into prepared pan, and bake until torte is golden brown and a cake tester inserted into the middle comes out clean, 50 to 60 minutes. It may be necessary to cover the torte lightly with foil to stop the top from burning. Transfer to a wire rack to cool for 10 minutes. Run a knife around the edge of the torte, and release from pan. Allow to cool completely on the wire rack. Place the apricot jam in a small saucepan over medium heat, and bring to a boil. Remove from heat, and strain. Brush glaze onto cooled torte. Sprinkle with sliced almonds and Powdered Sugar. 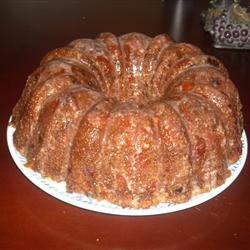 Combine raisins, rum and vanilla extract in small bowl; cover and stand overnight. Place all ingredients in a large bowl and mix thoroughly; pour into an ice cream maker and follow manufacturer’s instructions. 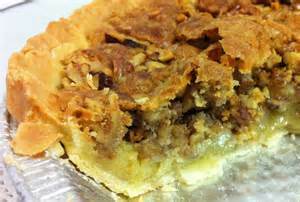 Press almonds into pie shell; bake at 450° for 12 minutes. Set aside to cool. Beat egg whites until stiff peaks form. Add lemon juice, almond extract and sugar. 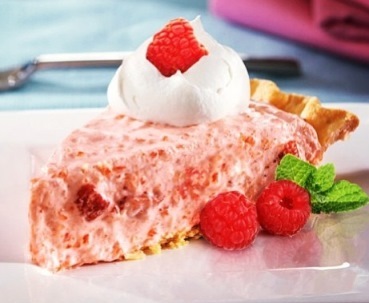 Fold in raspberries and whipped cream. Spoon into pie shell; freeze 4-6 hours. Serves 8. Combine eggs, pumpkin, sugar, corn syrup, vanilla, cinnamon and salt; mix well. Bake at 350° for 40 min. or until knife inserted in center comes out clean. Chill. Serve topped with whipped cream. Yield: one 9” pie. Cream shortening; gradually beat in sugar. Add eggs and pumpkin; mix well. Sift flour, baking powder, salt and spices together; add to pumpkin mixture; mix well. Add raisins and nuts. 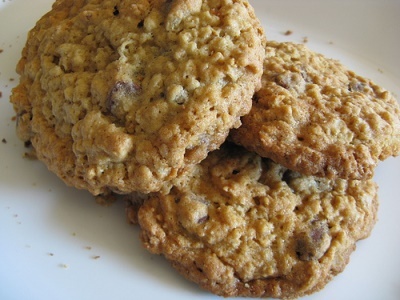 Drop by heaping teaspoon onto greased cookie sheets; bake at 350° about 15 minutes. (until firm to touch). Remove from sheets; cool. Yield: 4 dozen. For the icing, combine 2 cups confectioners’ sugar with 1 Tbsp. EACH lemon juice and grated lemon peel. Add just enough cream to make icing spreadable. 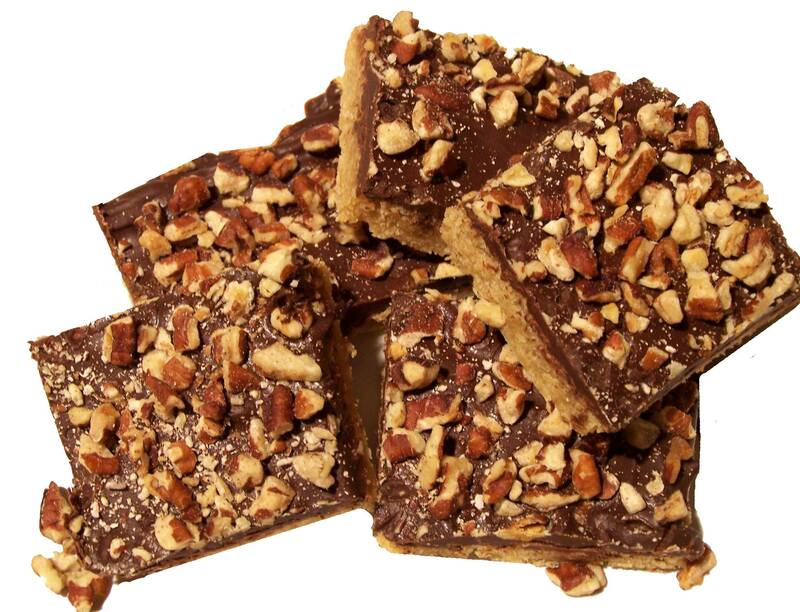 Melt butter; add flour and pecans; mix well. Put in a pie pan and spread out to cover the bottom of the pan. Bake 15 minutes. at 325°. Cool completely. Fill with any already-cooked pie filling, such as chocolate cream, canned berry fillings, ice box pies. This recipe makes one 9” x 13” pie crust or two 9” round pie crusts. Cream shortening and sugar. Add eggs one at a time, beating well after each. Melt shortening in large saucepan. Sift together all dry ingredients; stir into shortening. Add molasses, corn syrup and egg; mix well. Add oats and pecans; mix well. Drop off teaspoon onto greased baking sheet. Bake at 400° for 8-10 minutes. Combine dates, nuts and crackers. Add sugar, baking powder and flavoring. Pour into greased and floured pie pan or 9”x 9” square pan. Top with cherries and serve with whipped cream. Serves 6. Melt chocolate and butter together. Mix in honey, then eggs. Sift together flour and baking powder. Combine with chocolate mixture. Add vanilla and nuts. Bake in a well greased 7 x 11 or 8 x 8 pan for 35 minutes at 300°F. Sift flour mixture over fruit and nut mixture; stir until all are coated. Beat 4 eggs until light. Stir in 1 tsp. vanilla; pour over fruit mixture; mix with your hands. Bake in well-greased, paper lined loaf pan at 300 degrees for 1 1/2 hours; cool. In saucepan, combine 1/4 cup corn syrup and 3 tablespoons brandy. Preheat oven to 350°. Line a baking sheet with parchment paper or a silicone mat. 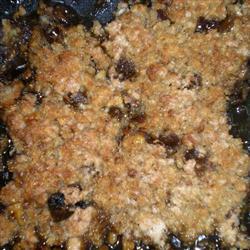 Combine the figs and water in a medium saucepan. Bring the water to a boil, cover, reduce to a simmer and allow the water to boil until the figs have absorbed it. Transfer the figs to a food processor and pulse, scraping down the bowl occasionally, until the mixture is completely smooth. Set aside and allow the filling to cool. 1-inch balls and arrange on prepared baking sheet. 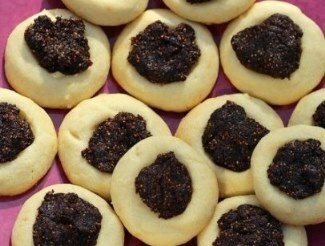 Press down in the center of the dough with your thumb to make a small well in the center of each cookie. Bake cookies for 8 to 10 minutes or until bottoms are lightly golden. Remove the baking sheet from the oven. If the indentation looks shallow, press down gently again to make the indentation deeper. Fill each with approximately 1/2 teaspoon pureed figs. Place baking sheet back in the oven to further cook an additional 3 to 4 minutes, until edges are lightly golden. Allow to cool for a few minutes on the cookie sheet to firm up before moving the cookies to a wire rack to finish cooling. For the cake, mix peanut oil and sugar; add eggs; beat well. Sift dry ingredients together. Add alternately with apples to first mixture. Pour into four 9” greased and floured cake pans. Bake at 350° for 15-20 minutes. 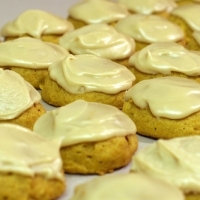 For the frosting, combine cream cheese and butter; cream until smooth. Add sifted powdered sugar, beating until light and fluffy. Stir in vanilla. Frost cake. 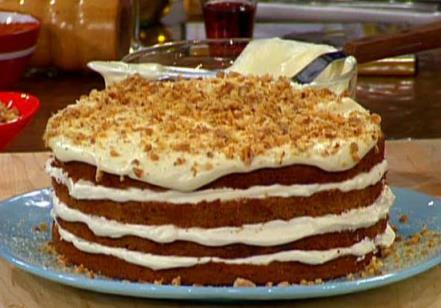 Sprinkle walnuts between layers and on top of cake. In a large pot melt butter and when it starts to clarify - smells good add sugar, dates, egg mix well bring to full boil and cook for 1 minute.In a large pot melt butter and when it starts to clarify - smells good add sugar, dates, egg mix well bring to full boil and cook for 1 minute. Stir in cereal, 1 cup coconut, cherries, vanilla until all ingredients come together. Let it sit for 10 minutes. Moisten your hands with little bit of water and make small balls. Roll in coconut. Keep in refrigerator in covered container. 1 cup Sunnyland Small English Walnut Pcs. 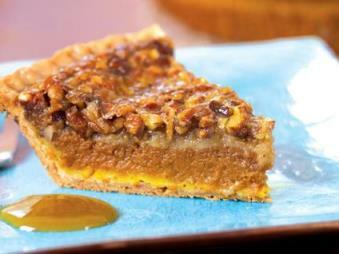 Mix ingredients well and pour into pie crust. Bake in a preheated 350° oven for approximately 25-35 minutes, or until top is crusty and golden brown. Serves 8. NOTE: Reserve the 3 egg whites for meringue topping, or top with whipped cream. 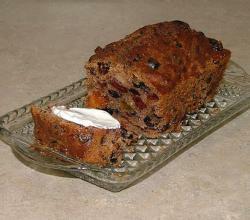 Combine sugar, flour, salt, baking powder; add dates, raisins, black walnuts. In a small bowl, combine milk, oil, vanilla and rum extract. Blend with flour mixture. Turn into 8 1/2” square ungreased dish. Combine brown sugar, water and butter. Pour on top of batter; bake at 300° for 1 hour. Mince apricots in a food processor. Place in a bowl and toss with brown sugar. Stir in 1/2 cup coconut, condensed milk and pecan pieces. 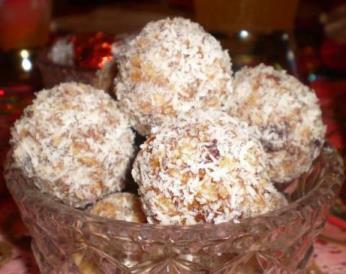 Shape into 1 inch balls and roll in coconut.